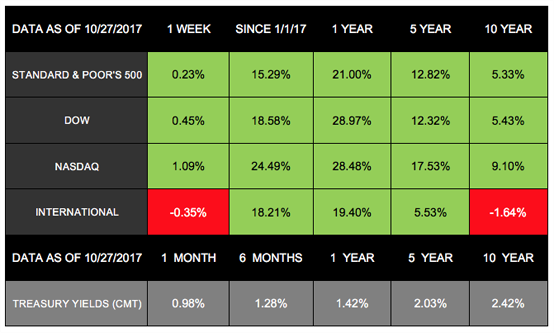 Another week, another round of positive market performance. The 3 major domestic indexes again ended the week with gains and new record highs. The S&P 500 rose 0.23% and marked a 7th-straight week of increases - its longest string of weekly gains in almost 3 years. The Dow added 0.45%, and the NASDAQ grew by 1.09%. Meanwhile, international stocks in the MSCI EAFE slipped slightly, losing 0.35% for the week. On October 25, we learned that September home sales were higher than anticipated and durable goods orders grew by 2.2% in the same month. This data provided more evidence that the economy is on solid ground. However, two other occurrences last week contributed even more to the continuing market gains: 1) Q3 GDP numbers and 2) tech companies' corporate earnings reports. 1. Economic growth beat expectations. Last week, 180 companies in the S&P 500 released their 3rd-quarter earnings data - marking the busiest week of this earnings season. Among the releases, several major tech companies reported much higher-than-expected earnings, contributing to the NASDAQ's biggest daily gain since 2016. With approximately 30% growth so far this year, the tech sector has grown at around twice the rate of 2017's overall market. 1. On Wednesday, we will learn whether the Fed plans to raise benchmark interest rates in November. 2. On Friday, President Trump will name a new head of the central bank. Janet Yellen's term expires in early February 2018, and the new Fed Chair will affect monetary policy for at least the next 4 years. If you have any questions about what you are reading in the headlines or experiencing in your own financial life, we are always here to talk.